Branding is a name, logo, slogan, and/or design scheme associated with a product. The specialists at Private Label Distillery will walk your through each part of the process. Having the “BIG” idea of the brand recognized and well thought out is the foundation of all strong brands. After branding has been drafted tracking resources must be established. The owners of the brand must have all the proper documents established in order to avoid confusion and permit problems. Making sure the company name and package design are well protected must be thought of well in advance. Trademark and patent applications can take up to 1 year to get approved. Private Label Distillery will help with all permits and applications when forming a brand or distillery. Private Label Distillery works with the best law firm in the country to avoid unnecessary costs and delays. PLD has an in-house design team that will produce a beautiful bottle shape, surface texture, label, closure and case box for your brand. All design includes photorealistic renderings of each component of the package. Spending time on design will save time on prototypes and mass production. Fusion Glassworks can provide decorated glass prototypes by making a test mould. Fusion can also prototype a custom closure, case box and POS items like glassware and bar mats. Fusion Glassworks was established in 2004 and in located in Shanghai, China. Fusion specializes in high quality spirit bottles and can arrange package delivery direct to Private Label Distillery. Please visit www.FusionGlassworks.com for more information. Private Label Distillery will create a unique formula for your brand and provide tasting notes and independent ratings. Private Label Distillery has the ability to fill and pack up to 600 bottles per hour. Our facility is dock height so sending and receiving shipments is a breeze. Distribution is the process of making a product or service available for use or consumption by a consumer or business user, using direct means, or using indirect means with intermediaries. 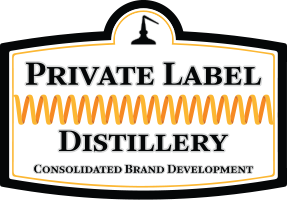 Private Label Distillery will get your product in front of distributors and help manage your brand in market. Marketing is the process of communicating the value of a product or service to customers. Marketing might sometimes be interpreted as the art of selling products, but sales is only one part of marketing. As the term “Marketing” may replace “Advertising” it is the overall strategy and function of promoting a product or service to the customer. Private Label Distillery will help you come up with a brilliant marketing plan and budget based on the market(s) your brand will launch in.